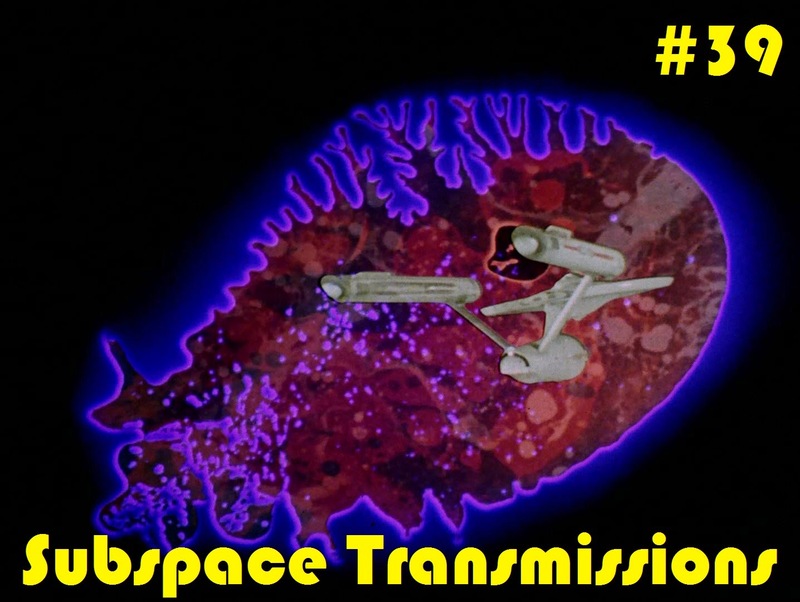 Subspace Transmissions: A Star Trek Podcast: EPISODE 39 - "TRIPPIEST MOMENTS IN STAR TREK"
EPISODE 39 - "TRIPPIEST MOMENTS IN STAR TREK"
Wait, when is 4/20 in Stardate years? Anyone? In this week's mind-bending episode straight-edge hosts Cam Smith and Tyler Orton attempt to celebrate April's greenest unofficial holiday the only way they know how; by soberly highlighting the most surreal and bizarro Trek moments that could potentially induce a pretty gnarly head-trip. From gargantuan psychedelic amoeba and Riker-brain milkshakes, to imaginary cave monsters and a bucking, whinnying Captain Kirk, there's no shortage of freaky and fantastical sights to groove to. So while we here at Subspace Transmissions have a firm "Hugs, not drugs!" stance, we'll leave it to your discretion to determine how best to experience these wild, weird and wonderful recommendations. Wanna appear on the show? Shoot us a 30 to 60-second audio clip letting us know what you think THE TRIPPIEST MOMENTS IN STAR TREK are and you could take the spotlight in an upcoming program! You can also send any other questions, topic ideas or feedback to subspacetransmissionspod@gmail.com! Be most excellent to one another, dudes and dudettes! BONUS EPISODE 10 - "STAR TREK: NEMESIS"
EPISODE 38 - "STRANGEST STAR TREK TRIVIA"